Two Textured Glass vanity lights in Granite subtly draw the eye with intriguing textures that add movement and dynamic interest. Not all sconces are made equally. But extraordinary design coupled with the right materials and finishes can yield light fixtures that offer long-lasting beauty and durability. Two of our Hammerton Studio collections feature sconces carefully crafted and damp-rated for enduring style and quality in bathroom designs. Both collections can add a surprising touch of fresh sophistication to contemporary and transitional bathrooms at very accessible price points. Glass is a popular material for in the bath, but rarely do you find glass fixtures with unique textures and details that add style and interest to bathroom designs. The Hammerton Textured Glass Collection includes a variety of kiln-fired glass cover sconces in four beautiful handcrafted textures. One can be installed horizontally above a mirror, or two can flank a vanity to add the perfect amount of illumination and artful appeal to luxury bathroom designs. The Tempest Collection features its stunning swirling steel & glass design in two cover sconces that bring an urban sophistication to bath spaces. Learn more about how to incorporate Hammerton lighting into your next home design project by contacting our Salt Lake City office at 801.973.8095, or by contacting a team member directly. Sleek wall sconces that exude a flattering, yellow glow can add warmth and vitality to an ultra-contemporary bathroom. Two contemporary wall sconces and a central chandelier can brighten up an expansive mirror, as well as a vanity countertop. Textured glass can create visual interest for functional task lighting. Most designers recommend using incandescent bulbs in the bathroom to produce complexion-flattering effects. A single fixture with a unique shape can illuminate key sections of the bathroom, including the area above a sink or vanity. 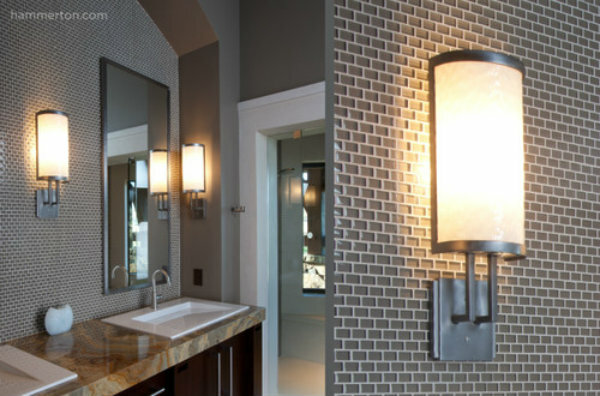 Long wall sconces placed on either side of a bathroom mirror can perform adequate task lighting for day-to-day activities. LIGHTING IT BEST TO LOOK YOUR BEST – WHAT MAKES GOOD BATHROOM TASK LIGHTING? Good task lighting can make the difference between a bright and a dark (literally!) start to your morning. Since bathrooms function as our main grooming centers, it’s important to make sure your task lighting evenly illuminates key areas, such as your mirror and/or vanity. Shadows are unflattering, especially when they’re cast below our eyes. This occurs when there’s only one light source coming from above. So, for adequate task lighting, it’s best to place light fixtures above and below, as well as on both sides of the bathroom mirror. For optimal results, stick with warm fluorescent vertical wall sconces applied with a cross-lighting technique. This will produce even lighting for a space that should be free of irritating glare and shadows. Of course, the rules for task lighting may vary from bathroom to bathroom. A lot depends on how large your mirrors are, as well as your bathroom’s interior décor – bright colors enhance lighting, while dark colors subdue them. According to the National Kitchen & Bath Association, larger mirrors that are 36 inches or more in width may require a different plan. NKBA suggests placing a more powerful light fixture over larger mirrors to eliminate dark shadows near the center. 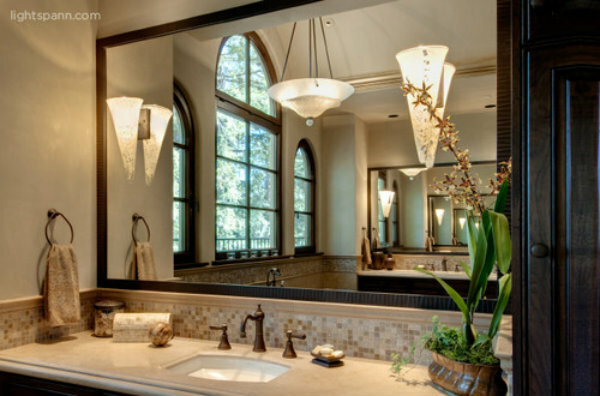 In contrast, smaller bathrooms require one fixture above, as well as one on each side of the mirror. A central ceiling light – which can be a decorative one – can also help brighten up vanity countertops. Good bathroom task lighting also requires that you use the right light to produce “natural, complexion-flattering properties.” Most designers recommend using incandescent bulbs in the bathroom to produce this desired effect. However, compact fluorescent fixtures are a good alternative since they demand less electricity, while still producing a warm color and a flattering effect. Light fixtures that perform task lighting are essential for carrying out day-to-day activities. If you’re interested in brightening up you bathroom for practical purposes, Hammerton can craft wall sconces in a variety of styles to enhance your home’s functionality and aesthetic. Contact us for more information. 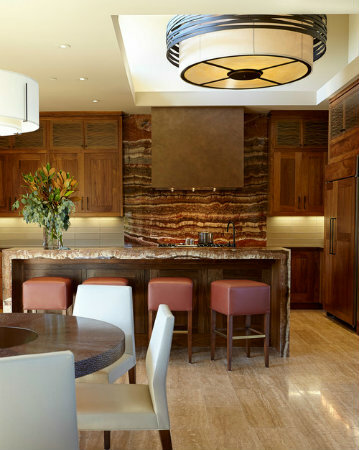 From Hammerton's Contemporary Collection, both the island light and bar pendants in this luxurious kitchen are scaled to perfection and beautifully complement the surrounding finish materials. The slender contours of this hand-sculpted Hammerton Seriph chandelier can create a uniquely refreshing style for both traditional and contemporary kitchens. A close up of the Seriph light from the previous photo shows how our artisans can reinvent a classic aesthetic for contemporary kitchens. An interesting mix of cool, shiny finishes, this pair of Tempest drums serve as a great example of how repeating similar finishes in a kitchen can achieve a cohesive look. Interior by Dawn Hearn interior Design. 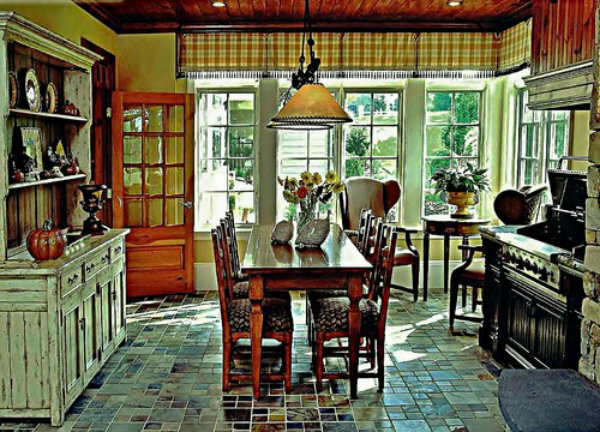 Three contemporary chandeliers serve as the focal point of this beautiful breakfast room. A geometric fixture can add an unexpected touch of modernity to an open kitchen. smaller-scaled chandelier can add an understated touch of elegance to a spacious kitchen. This eclectic fixture also shows how a light can be designed as a functional source of illumination, as well as a useful pot rack. 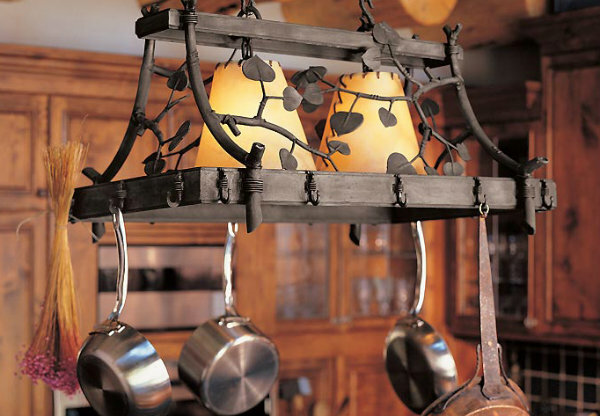 A central kitchen chandelier can also do "double duty" as a functional pot rack. This Hammerton table light's lashed rawhide shades underscore the rural country style of an English kitchen. The graceful proportions and sophisticated metalwork of this impressive Hammerton Chateau chandelier exudes a classic, Old World feel. This custom Lightspann Cyclone chandelier made from light steel and linen is 6 feet in diameter. Designer Pamela Pennington used it to visually separate the working and eating areas of this large kitchen. Brilliant chandeliers are often relegated to our home’s more formal areas, while in the kitchen — “the most utilitarian room in the house” — we usually settle with predictable pendants or function-focused ceiling lights. But in recent years, kitchens have become much more than a functional space for daily cooking tasks. Dressing up the ceiling with an eye-catching chandelier is an easy way to dial up the aesthetic appeal in any kitchen. A chandelier transforms what’s traditionally viewed as formal lighting into a functional fixture for the kitchen, and can add an impressive and unexpected designer touch. Create a Focal Point: Hanging a chandelier above a central workspace — e.g. a kitchen island or breakfast table – is a bold way to enhance visual interest. It also makes the space appear more voluminous by drawing the eye upward. Consider both Aesthetics and Function: Kitchens need lots of light, so make sure that your chandelier provides a meaningful light source as well as eye appeal. Choose a chandelier with lots of light output and consider fixtures with downlights to directly illuminate work surfaces or high traffic areas. Reflective materials can also help magnify the light. Avoid chandeliers that primarily direct light upward. Choose Materials that Enhance the Space: Chandeliers that repeat materials and finishes already used in the kitchen can create a sense of harmonious balance, but consider adding a splash of personality. For example, introducing a new material with a complementary design palette can provide an unexpected visual “twist” on existing interior elements. In a monochromatic kitchen, a chandelier can be cleverly deployed to add a surprising pop of color. Focus on Scale: Scale is a very important but frequently overlooked design tool. 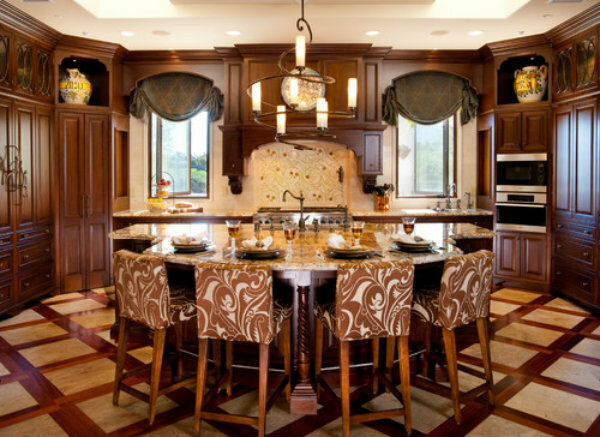 In an expansive kitchen, standard size chandeliers are often too small for the space, so consider either a custom-sized chandelier or a pair of standard sized chandeliers or large pendants. 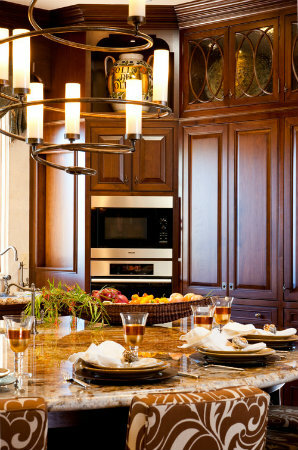 Conversely, a large or ‘visually busy’ chandelier can easily overwhelm a smaller kitchen. 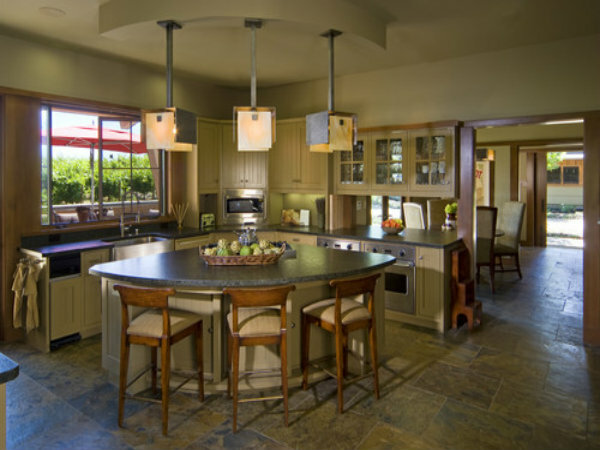 Layer Kitchen Lighting: As Houzz describes, there are seven levels of illumination that should be considered in a kitchen lighting plan: countertop and general lighting, under-cabinet task lighting, over-cabinet up lighting, accent cabinet lighting, supporting sconce fixtures, ceiling lighting and a central accent fixture. A well-chosen chandelier can satisfy your central accent and ceiling lighting requirements, and eliminate the need for several functional ceiling cans. Finding the perfect “off the shelf” chandelier that fits every functional and aesthetic requirement can be difficult. At Hammerton, we routinely accommodate our customers’ unique specifications by scaling or modifying existing fixtures from our catalog. We also frequently work with customer specified materials and design custom fixtures entirely from scratch. 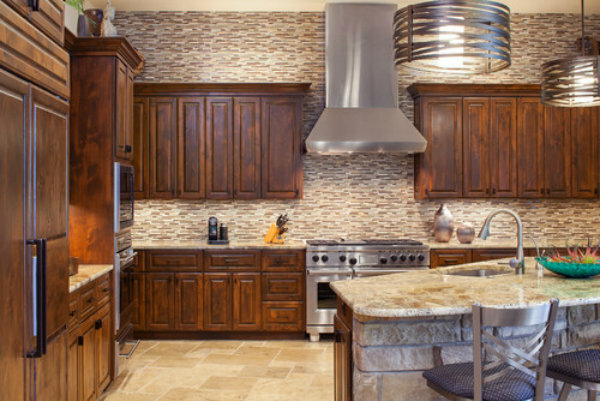 Contact us if you’re interested in lighting up your kitchen with an impressive chandelier. From the Hammerton Studio Rimelight collection, this glittering drum chandelier of kiln-fused glass offers a versatile yet elegant lighting solution for sleek, minimalistic bathrooms. A blown glass bowl pendant adds artistic detail and commands focus on the beautiful tub in this master bath. A row of sleek Bamboo glass sconces and a clean-lined glass and steel ceiling fixture give contemporary style to this master bath. 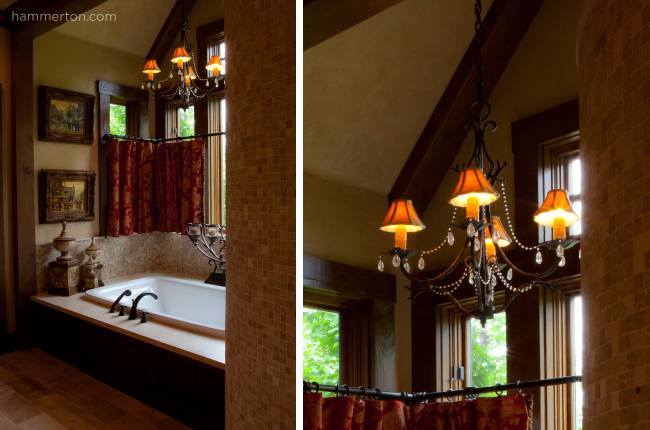 A delicate candle-style light fixture adds a luxurious and sophisticated touch above a cozy tub. A modest light fixture with a simple shape and opulent details strikes the perfect balance between functionality and aesthetic appeal. From the Hammerton Studio Textured Glass collection, this drum chandelier in Strata evokes an organic aesthetic that adds warmth to this monochromatic bathroom. An elaborate fixture with traditional shades and beaded details is an unexpected way to add style to this master bath. ADDING STYLE TO THE BATHROOM? START WITH THE CEILING! Distinctive ceiling fixtures – from eye-catching flush mounts to dramatic chandeliers – are great features to incorporate in master baths. 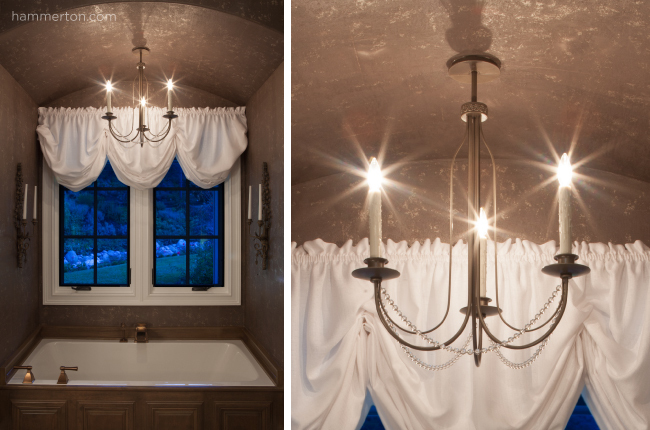 Traditional powder rooms are also great places to add a luxurious ceiling light as a surprising touch. In all bathrooms, though, it’s important to keep an appropriate balance between task and ambient lighting. Give a bathroom new life by swapping out its standard ceiling light for one that takes the room to the next level. Take a look at the gallery above for inspiration, and contact us to explore new ceiling fixture possibilities for your bathroom. Spa baths and outdoor spaces can be divine, but the kitchen is the heart of the home. Having evolved past their utilitarian, back-of-the-house origin in the American household, kitchens are now the center of all activity and the anchor of the 21st century space known as the great room. Before landing their starring role, kitchens were mere workhorses designed purely for function, and aesthetics were a superfluous concept. But now that kitchens are on full display for all who enter the home, aesthetics and functionality are expected to work together simultaneously as top design considerations. 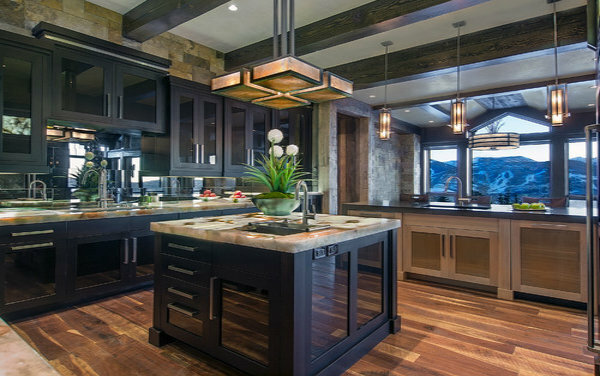 Every aspect of the kitchen – from appliances and cabinetry to countertops and flooring – have been reinvented to accommodate the kitchen’s new “crown jewel” status in the home. So when it comes to kitchen lighting, boring, task-oriented pendants just don’t cut it anymore! Fixtures are now expected to enhance the kitchen’s aesthetic design while also providing additional ambient, task or accent lighting. Thoughtful kitchen design seamlessly incorporates lighting to define work spaces, accentuate architectural or interior details, and connect the kitchen with surrounding spaces including living, dining, office and outdoor areas. 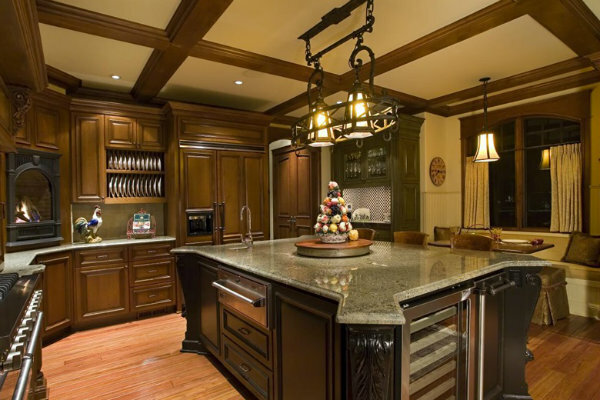 Featured here are several kitchens with Hammerton and Lightspann light fixtures that provide both aesthetic and functional value. 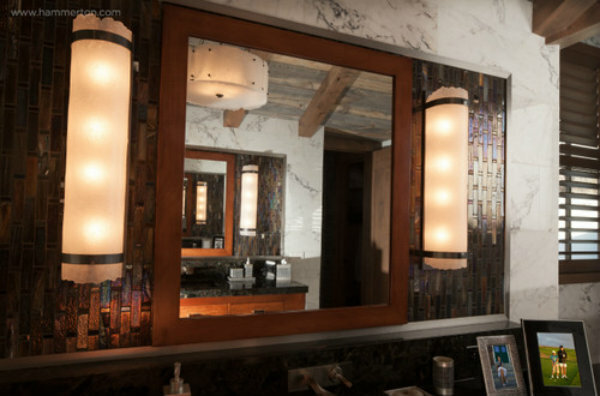 Custom Lightspann Sidelight sconces featuring boldly textured and handcrafted panels of fused glass offset the smooth surface of the surrounding vanity wall. Subtle swirls of warm color in the dark art glass lens of this Hammerton sconce quietly nod to the organic aesthetic in this transitional powder room. 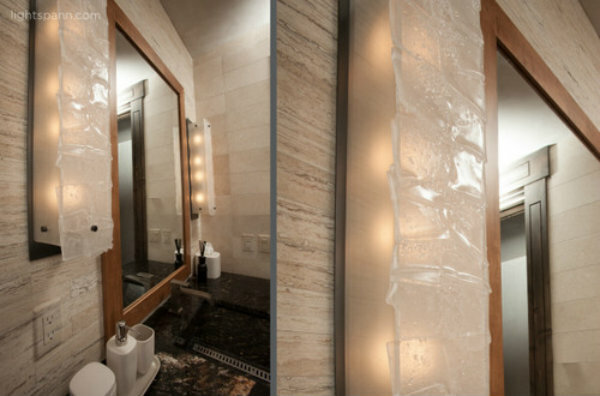 Custom Lightspann Bamboo clear and frosted blown glass sconces add subtle yet surprising interest in this bathroom. 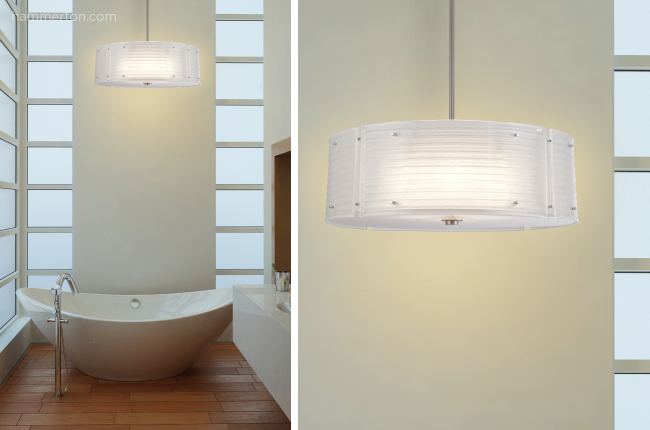 Simple cover sconces featuring beautifully stitched rawhide enhance the contemporary rustic feel of these two baths. Light art glass lenses underscore the artisan craftsmanship of these Hammerton cover sconces and complement the color palette in this contemporary bath. 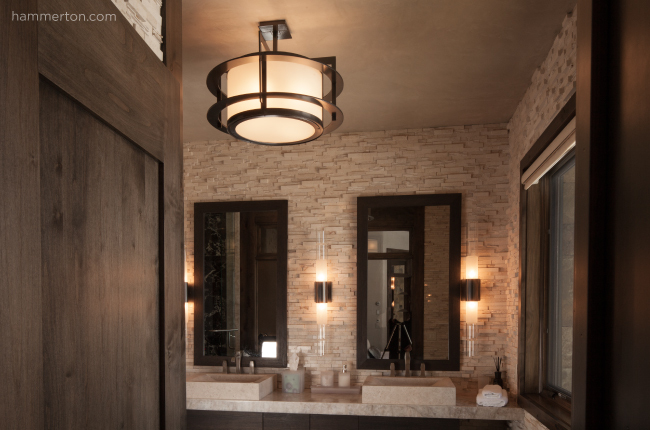 Simple and elegant: these Lightspann sconces made from slumped panels of crystal-textured fused glass provide a soothing counterpoint to the dark finishes in this master bath. Lightspann Luna sconces featuring twinkling star light glass and a clear lip wrap complement the restful color palette of this bath retreat. Hammerton is on a mission. 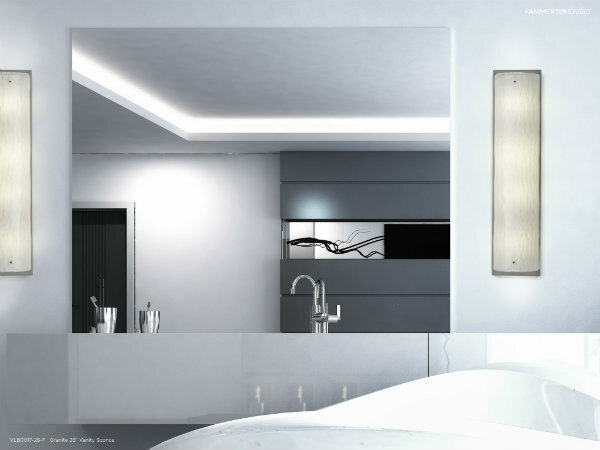 We want to erase the haunting image of uninspired bathroom lighting out of the minds of designers and homeowners. While every design decision can make the difference between boring and beautiful, lighting can make or break it all in a bathroom. This space requires light fixtures to perform a subtle balancing act. Of course, bath light fixtures must provide the proper amount of both task and ambient lighting. As the Lighting Association of America explains, “decorative wall fixtures placed on each side of the mirror will provide the even, shadow-free facial illumination necessary for daily grooming tasks.” But the aesthetics of the fixture itself are just as fundamental. The key is to choose fixtures that simultaneously provide proper illumination and enhance the bathroom design by adding visual interest. One of our favorite strategies for achieving beautiful and functional bathroom lighting is to introduce materials in new and unique ways. Take glass for example. Perhaps the most common bathroom material, glass frequently falls victim to the same function-focused applications over and over again. Yet glass serves as a marvelous artistic canvas, incorporating light, color, texture and sculptural form in a single medium. It has the capability of elevating bath design to a whole new level, even on a budget. At Hammerton we’re helping clients look at glass in interesting and unusual ways that take bath mirror sconces from drab to dramatic. Shown are a few examples. Let us know what you think!